Rachael Ray is a spokesperson for Dunkin' Donuts and it is having another fun event in NYC, although Rachael Ray won't be appearing at it. If you live in NYC, the event is happening on February 13th to celebrate the launch of Dunkin' Donuts' new Oven-Toasted Menu. You can get free samples of new toasty flatbread sandwiches, personal pizzas, hash browns and Dunkin’s famous coffee. Relationship expert and Time Out New York Dating Columnist, Julia Allison, and celebrity cabbie matchmaker, Ahmed Ibrahim, will also be on hand to give free advice to help New Yorkers with any pre-Valentine's Day questions. WKTU's Cindy Vero, co-host of "Cubby in the Morning," will also be giving away a vacation to a warm locale. The event starts at 8 AM and goes until 2 PM on February 13th, at Herald Square (34th St. and Avenue of the Americas). Eat some free food for me if you go! 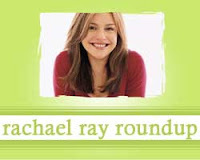 Learn more about the woman who was awarded a $1,000 shopping spree on Rachael Ray's talk show. Crunchy Domestic Goddess particpated in a No Meat week event using recipes from Rachael Ray's 365: No Repeats. Claire at Cooking is Medicine thinks Rachael Ray's 5 minute Fudge Wreath is a great present for your sweetie for Valentine's Day. Kathy at the Tuscaloosa News morphed Rachael's reicpe for Oatmeal Cookie Pancakes into a lighter meal. Janet Keeler of Stir Crazy tried at recipes for Rotisserie Chicken pasta from the new issue of Rachael Ray's magazine. Tara of Pages Stuck Together writes a detailed narrative of her trip to a taping of Rachael Ray's talk show.